Responding to new creature comforts its competitors are offering on prime transcontinental routes, United said it will introduce hot meals for Economy Plus passengers and will add San Francisco-Boston to its premium transcon network, with flat-bed seats in the front cabin on all flights. In doing so, it will eliminate its longstanding premium branded service product known as “p.s.,”and refer to the new product as simply Premium Transcontinental Service. The airline said that effective July 1, in-flight food and beverage service for passengers in its extra-legroom Economy Plus seating on Premium Transcontinental routes (Newark-SFO/LAX and now Boston-SFO) will include a free hot entrée, dessert and fruit, pre-arrival snack, and alcoholic drinks. The upgraded flights are available for booking today. As with United’s premium flights into Newark, elite level members of Mileage Plus can use their status to upgrade to Economy Plus. 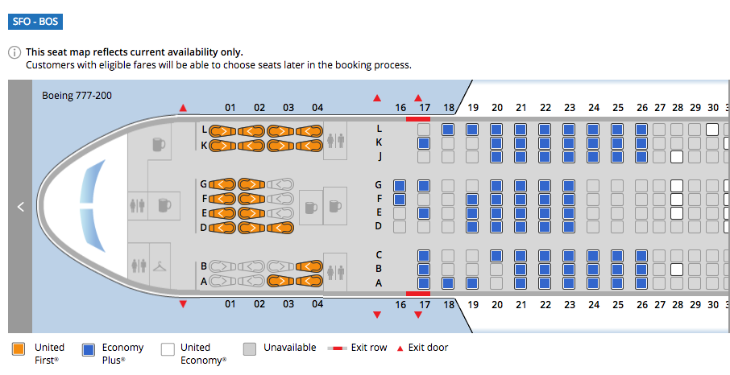 But status won’t get you into the cozy confines in those big seats at the front of the plane– you have to pay for that. Checking today, the cheapest round trip business class nonstop between SFO and BOS is running at about $1,200. Economy class is is about $450. Its new Boston-San Francisco schedule will use mostly 757-200s. But it will also have 777s on the route (“the market’s only widebody service,” United noted), including early-morning departures from both cities, an 8:30 p.m. departure from Boston and several red-eyes from San Francisco. “The most popular timings in peak periods will operate with widebody Boeing 777 aircraft including 8 a.m. service from San Francisco and an early evening Boston departure, ideal for business customers traveling at the end of the work day,” United said. Back to the upgraded food offerings… “Sample menu selections include savory roasted chicken with a smoked barbecue sauce and butternut squash tortellini with sage cream sauce. Dessert options will include New York’s favorite sweet treat, cheesecake, as well as a chocolate brownie and fresh seasonal fruit,” United said. 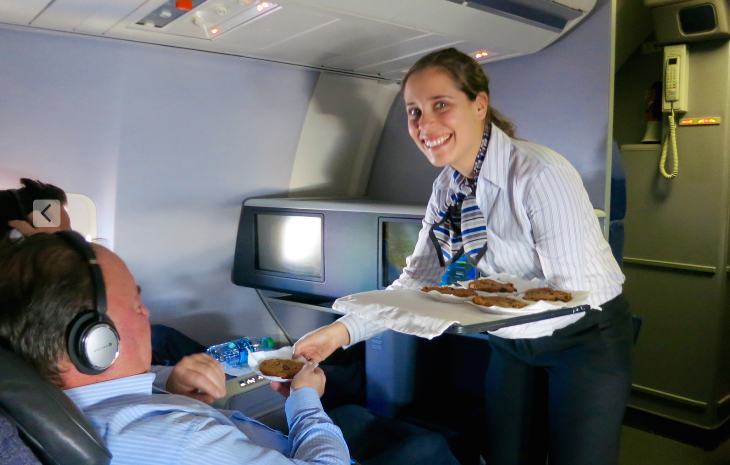 In recent weeks, both Delta and American announced free meals for main cabin passengers in transcontinental markets. Delta said it would offer the amenity on a dozen coast-to-coast routes, while American limited it to JFK-LAX and JFK-SFO. The difference in United’s announcement: Delta and American are serving up free cold meals to all economy passengers; United will offer hot meals, but only to those with Economy Plus seats, not all main cabin passengers. 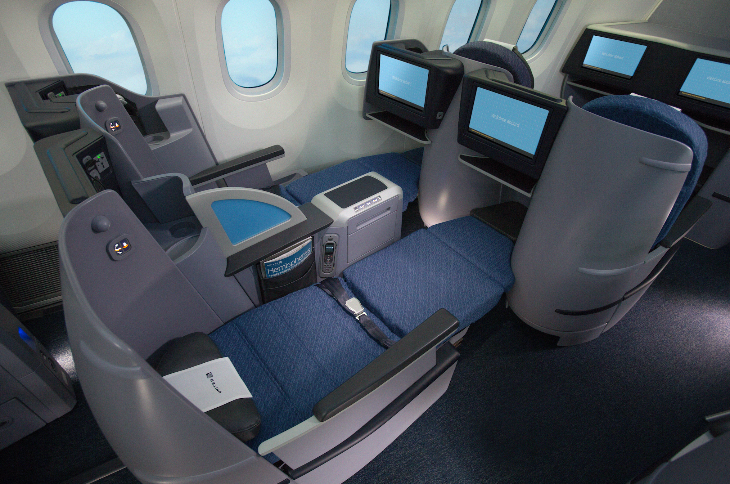 By adding Boston-San Francisco to its premium transcontinental network, United is promising flat-bed business class seating on all flights in that market. The flat-bed battle for SFO-BOS customers started when JetBlue expanded its premium transcontinental Mint front-cabin service to BOS-SFO; then Delta announced it would jump back into the Boston-San Francisco market on June 8, offering two flights a day using 757-200s configured with front-cabin flat-bed seats. United said that in addition to flat-bed seats, its SFO-BOS business class service will provide duvets and pillows from Saks Fifth Avenue; new amenity kits, also from Saks; a signature Moscow Mule cocktail; hot towel service; and seasonally refreshed cuisine from a network of celebrity chefs. After suffering through years of flying on United’s oldest, tattiest 757s on frequent trips to Boston, this is great news– mostly because those 6-7 hour slogs are so painful. 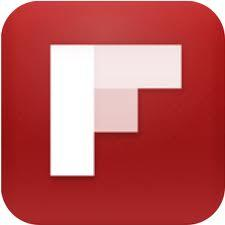 What do you think of the new service? Which airline will you likely fly between California and Boston? Please leave your comments below.